Every day I pass new homes and catch a glimpse of their garages only to see a mixture of home garage storage made up of shelves, hooks with hanging items from the wall and lots and lots of items sitting on the ground by both walls. I suppose once you have invested so much money onto a new home and garden, the last thing you want is to invest more money into your garage? It’s already built, the four walls are there. Just like a kitchen however, it needs cupboards, bench space, cooking appliances, washing accessories and so on. Your garage is much the same. It needs furniture to make it work. Furthermore, garages in most modern homes sit at the front of the home and are usually the first room you see when you arrive. Pass any new home with a packed and messy garage and you don’t get a great first impression. Unlike the older homes with the garage at the end of the driveway, new homes make a statement with their garages. They are also another entry point into the house. Home garage storage is best done over time but with a combination of furniture which will help you manage both large and small items. Items which are used regularly and those that aren’t. Items that are long and short as well as awkward. Garages also need to store everything else the home doesn’t want. Every garage definitely needs shelving, but going end to end with shelving will also take up a lot of room because it is usually 500mm deep. This is space you no longer have if your garage is made of mostly shelving. 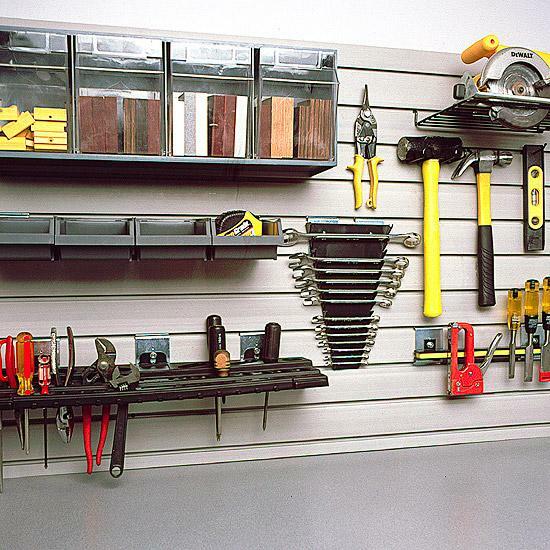 Wall panel storage options are a great option because not only can you utilise the full height and length of your wall, you can use it to store garage items of all sizes. This includes the awkward ladders and wheel barrows. It also includes the brooms, rakes and other pole based equipment usually forced into the corner so they remain upright. 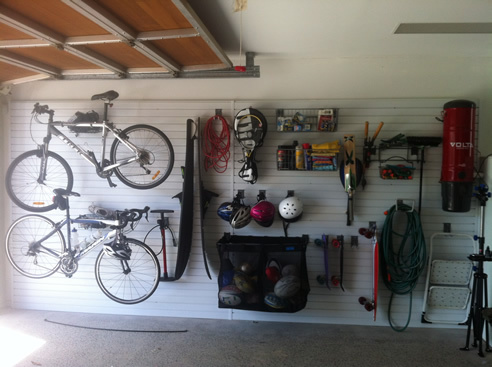 Wall based home garage storage can also cater for your bikes hanging either vertically or horizontally. The great range of hooks will also cater for all of your power tools. Then there are the great range of smaller shelves. These come in wire, plastic of heavy duty metal. Some are about 800mm on length and others 1.2m. There is actually very little a wall based storage solution can’t handle. Best of all, hanging items directly on your wall means they are off the floor. An additional advantage is that the depth of your storage is linked to the depth of your stored items (unlike the fixed depth of a shelf).